Whilst all the recent media focus has been on next week’s highly controversial Heavyweight clash, between David Haye and Dereck Chisora, another, and probably far more significant, Clash of the Titans takes place this coming Saturday, with the long awaited showdown, between former British Cruiserweight Champion Leon “Solid” Williams and current Southern Area Champ Tony “Conqueror” Conquest, taking place at York Hall in Bethnal Green. After three false starts, each due to injury, this most defining of domestic Cruiserweight battles will also decide, for once and for all, just who is the Capital’s true #1 of the division as well as, along the line, earn the winner a shot at the coveted Lonsdale Belt. The early betting seems to be heavily in favour of Streatham’s Former Champ Williams. No surprise really, as when the pair met as Amateurs, Romford’s Conquest was knocked out in just 45 seconds of the first round! Earlier today, following his final training session at the TRAD TKO Boxing Gym in Canning Town, Leon Williams spoke briefly on the upcoming battle with his old foe and good friend Tony Conquest, We’re really good friends but that’s on hold until after the fight, during the fight it’s purely business. The plan is to just get my rounds in, punch hard and keep pressuring him and get the win, then say sorry afterwards and I’ll be the first to buy him a drink. Then I want a shot at getting back my British title. That’s the main goal and that’s where my motivation for this fight is coming from. If it wasn’t a stepping stone to get the Lonsdale belt back where it belongs, with me, I probably wouldn’t have taken the fight. The Southern Area title isn’t really what I want to fight for, I’m not devaluing the title at all, it’s a very worthwhile title, just me and my team feel it is a backward step as I was British Champ earlier this year. I will get back there, but first I have to win this fight, and I will win this fight. We train hard at the TRAD TKO, me, Johnny (Manager/Coach Johnny Eames) and Barry (co-trainer Barry Smith) and we will get back to where we were, and I will get my British title back. Leon “Solid” Williams versus Tony “Conqueror” Conquest for the Southern Area Cruiserweight title co-headlines Olivia Goodwin’s One More Round event at York Hall in Bethnal Green, London on Saturday 7th July 2012. 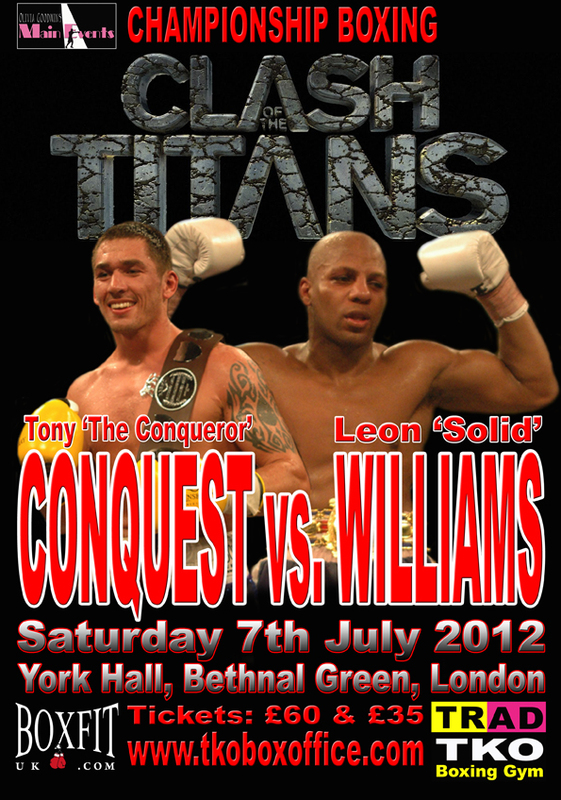 There are limited tickets, priced £60 (Ringside) and £35 (Standard Seated), still available, for Leon Williams vs. Tony Conquest, on-line now at www.tkoboxoffice.com - tickets are also be available direct from Leon Williams or the TRAD TKO Boxing Gym, Gillian House, Stephenson Street, Canning Town, London E16 4SA.